LP will ship on or around 12/5/20108. Download link will be sent via email on release date, 11/2/2018. Barbra has done it again by opening our eyes and our minds with the use of her wonderful voice. Looking forward to joining her on the journey with “walls” I have been a fan since I was 6...loving her voice and legacy! “Don’t Lie To Me” was just released &amp; I am SO anxious to hear the entire “Walls” CD! 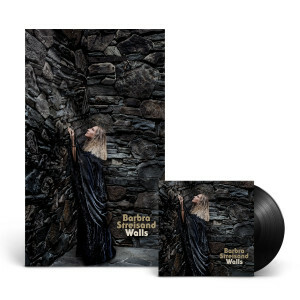 Barbra’s first released single is an extraordinarily heart-wrenching plea that combines her voice at its best with totally relevant lyrics and a catching, memorable melody! I first heard “Don’t Lie To Me” at the magic 6:15 am, when it was released! I couldn’t go back to sleep, as I could not get the melody out of my head nor the emotional thrill of hearing Barbra at her best singing a song she co-wrote! I’m holding my breath for “Walls”. Thank you, Barbra, for another gem!